12. 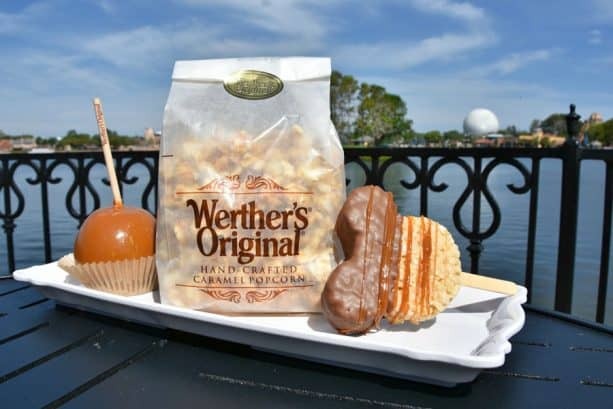 Gourmet Caramels – Karamell-Kuche – One of the most popular and busy areas in Epcot’s World Showcase is the Germany Pavilion which is designed to feel like a quaint town center in a traditional German village. Many guests who visit the location love to order up authentic German cuisine and beer at the full service Biergarten Restaurant and the quick service Sommerfest counter both located in the rear of the area. However, there is also another quick service location that guests are sure to absolutely love as it serves up delicious treats featuring caramel. Karamell-Kuche is set up like a store on the left hand side of the pavilion and guests can enjoy all sorts of freshly made gourmet caramel treats such as Caramel Corn, Caramel and chocolate dipped fruits including pineapple, and even bite sized chocolate covered caramels sprinkled with sea salt. With so many amazing options to choose from, guests simply must enjoy something from Karamell-Kuche.